For the contemporary organisation, corporate business travel remains a viable function that helps build customer and client relationships and improve overall business development. 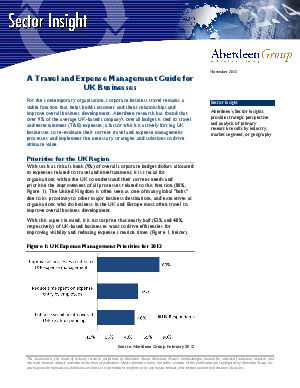 Aberdeen research has found that over 9% of the average UK-based company's overall budget is tied to travel and entertainment (T&E) expenses, a factor which is actively forcing UK businesses to re-evaluate their current travel and expense management processes and implement the necessary strategies and solutions to drive ultimate value. Download this Aberdeen research report to learn more.